About a month ago I got a note, which I shared with all my readers – Barcelona Restaurant in Greenwich is offering a special wine education program, called Passport Through Spain – 4 evenings of exploring the wines of the different regions in Spain, of course accompanied by the food. I didn’t have a chance to attend the classes until the very last one – but boy, am I happy I was able to attend at least one class! The last class was focused on the region called Valencia. Valencia is more known for its paella and oranges than for its wines – but this is probably what made it more fun for me. 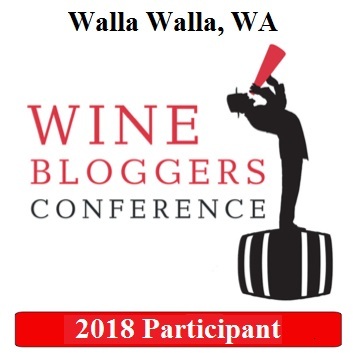 The previous three classes were focused on Rioja, Galicia and Priorat, and I’m somewhat familiar with the wines of those three regions – but Valencia is quite unknown to me, and thus intriguing. Region of Valencia is located on the east coast of Spain, along the Mediterranean sea line. There is a number of winemaking areas in Valencia, with Jumilla probably being the most known. There is a mix of climate zones in the region, some been more Mediterranean, and some more continental, but the very hot temperatures are quite common throughout the summer. However, in the areas with the continental climate the temperatures can drop very low in the evening, so the grapes can achieve great flavor concentration and depth. Similar to all other regions in Spain, the quality of wines in Valencia is steadily increasing, with the regions such as Valencia, Utiel-Requena and Alicante taking their place on the wine map. There is a mix of indigenous and international varieties growing in the region, with probably Malvasia and Moscatel being stars among the whites, and Monstrell, Bobal, Garnacha Tintorera and Garnacha Tinto among the reds. The Valencia wine class was conducted by Jose Valverde, the Sommelier at Barcelona Greenwich, who is the wealth of knowledge and just a pleasure to listen to. We started with the wine called 2010 Bodegas Rafael Cambra Soplo Valencia DO (14% ABV, 100% Alicante Bouschet/Garnacha Tintorera, 3 month aging in oak) – it was this wine, made out of the Alicante Bouschet, known in Spain as Garnacha Tintorera, which prompted my last wine quiz – so here you can read some interesting facts about that grape. Palate: Perfect acidity, cassis, almost a Cabernet Sauvignon/Cabernet Franc profile, espresso, touch of bell peppers, very restrained. Barcelona is actually a restaurant group, and they have a number of restaurants in Connecticut and even outside, all focused, of course, on Spanish food and wine. It was very interesting for me to learn that Barcelona takes the idea of cultural heritage very seriously – yes, I’m talking here firstly about food, cooking and overall Spanish cuisine traditions. Every year the group of chefs and other people who make your restaurant experience special, travel to Spain to immerse into, to embrace the cuisine, the food, the wines, to learn the ways Spanish restaurants operate. Best of the best is brought back home and then shared with us, lucky customers, in the form of special food and special experiences. 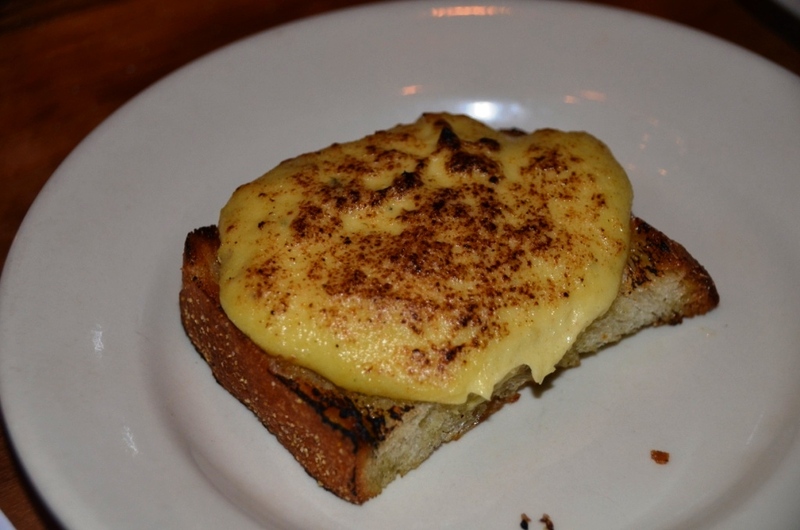 The very first dish which was served to us, lucky customers, was the Toast with Bacalao Spread. Executive Chef Michael Lucente tasted that dish at one of the restaurants in Spain while being on educational trip. He loved the dish, and he asked for the recipe. Guess what – he didn’t get it, as the chef outright refused to share it. Chef Michael spent a year (!) perfecting that recipe, but as a foodie I think it was totally worth it. Incredible balance of flavors, and texturally interesting – this was one delicious tapas. We continued our journey through Valencia with 2010 Bodegas Sierra Norte Pasión de Bobal Utiel-Requena DO (13.5% ABV, 100% Bobal). Bobal is a unique Spanish grape, which doesn’t grow anywhere else – however. there is plenty of it growing in Spain, with more than 80,000 acres, which makes it one of the most planted red grapes in the world. The climate in Utiel-Requena is one of the harshest in Spain, with very hot summers and cold winters with frost and hail, but still, the grapes persevere! Nose: Freshly crushed grapes, but restrained. Brighter nose than the previous wine, with some black cherries, herbs and tobacco. Palate: Noticeable tannins, but overall light, open and clean, should be very food friendly. I crave the complexity of the first wine! The dish which was served with dish was Roasted Hen with pimento, fried chick peas and cilantro. The dish itself was very tasty, with all the flavors perfectly melding together – and it also worked perfectly with the wine! All those mild flavors of the wine very complementing bold flavors of Mediterranean cuisine, so this was definitely an excellent match. Our last wine of the evening was 2009 Pedro Luis Martínez Arriba Término de Hilanda Monastrell, Jumilla DO (14.5%ABV, 100% Monastrell, 14 month aging in new American and French oak) – Monastrell, which is a lot more international grape than the previous one (it is known as Mourvedre in France and Mataro in Australia), is definitely the best known grape in this tasting group. One problem I often have with Monastrell wines is that they are made overly jammy, with lots of in-your-face overcooked fruit. Luckily, not this wine! Palate: Powerful, coffee, dark chocolate, espresso, black plums, firm structure with spicy undertones, tar. Thought provoking, with excellent balance. Care to guess what our last dish was? Yes, Paella! You can’t have a class on Valencia wine and not experience the classic of the cuisine. It was not even one paella, but two – both seafood and meat (rabbit and sausages) paella were served, and they both were absolutely delicious! No, I’m not going to describe them to you – just get to the restaurant and taste it for yourself. That was definitely an evening of fun learning, great food, great wine and great conversations. There are only a few things are left for me to do here. 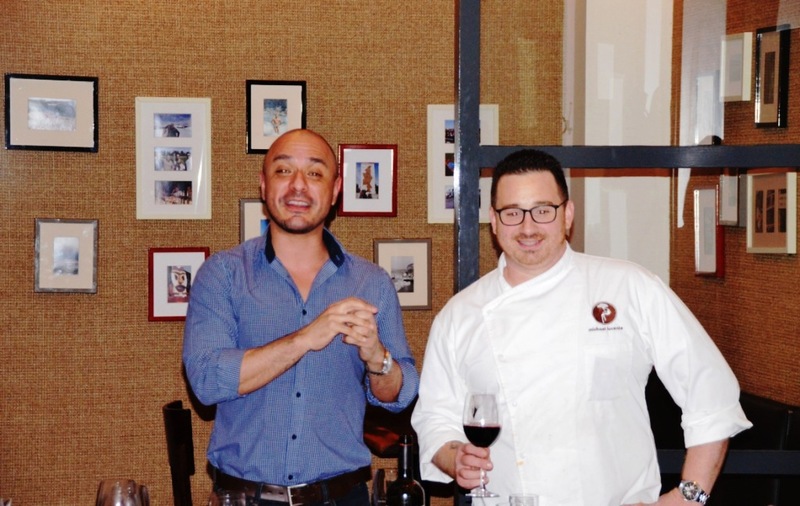 First of all, I want to thank Barcelona Greenwich Sommelier Jose Valverde, Executive Chef Michael Lucente and PR Director Ria Rueda for the excellent program and great experience of Spanish wines and Spanish cuisine. Also, I want to bring to your attention the fact that Barcelona Restaurant group does a lot of work to educate the customers on both food and wines of Spain, so you will do yourself a lot of good if you will check their calendar and sign up for updates – there are great events happening literally every week! You can find Barcelona Restaurant and Wine Bar calendar right here – it covers all of the Barcelona locations and even more general events where Barcelona restaurants participate, so don’t think you should live in a close proximity of Greenwich to take an advantage of these special events. And we are done here. 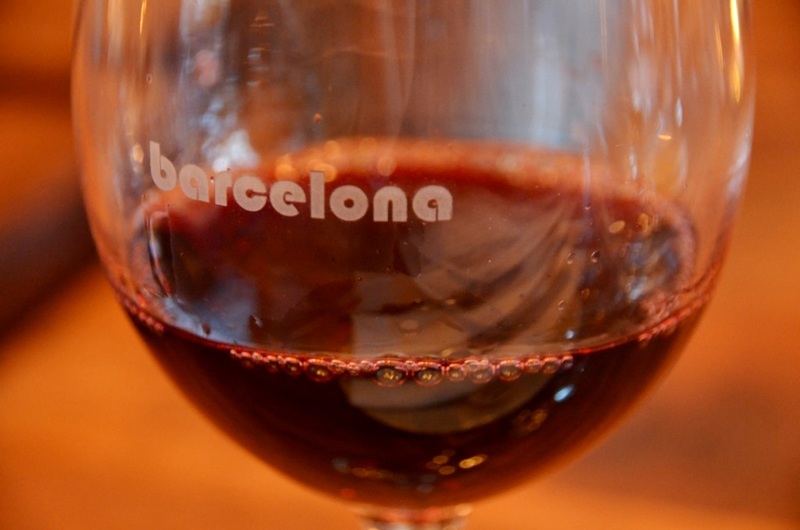 If you are looking for the great Spanish food and wine experience – there might be a Barcelona restaurant near you! Cheers! I absolutely adore Spanish wines!! Though I agree with you on the Jumilla . . . all too often it’s waaaaay too jammy for me. It’s always nice to find one that has some finesse. That paella looks fabulous!! Salud! 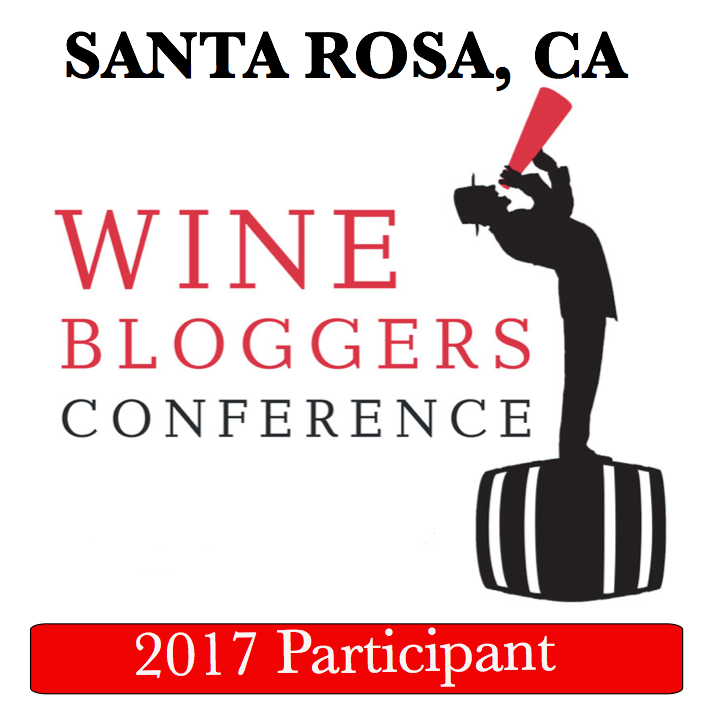 yep – Spanish wine is my generally favorite wine category ( even thought I’m trying not to pick favorites : ) ) . This Monastrell was outstanding – very very drinkable and perfectly balanced. And Alicante Bouschet was simply a treat! I’m jealous! What a fun night!